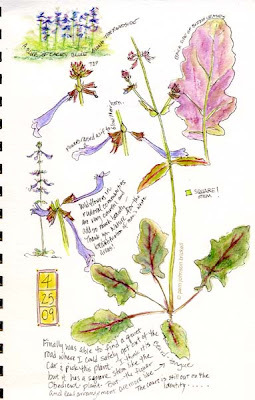 South Carolina LowCountry Nature Journaling and Art: Beard-tongue or ? For the last couple of weeks this wonderful plant has been blooming along our roadsides. Always in large groups, it's such a pretty blur of lavender blue to see when driving. The problem is stopping to pick a sample as there are four lanes of 50 - 60 mph traffic! Finally, I discovered some on a quite side road and stopped to pick a sample. I brought it home, put it in water and went to my wildflower books. It has a square stem. The flower arrangement is more similar to the Beard-tongue, Penstemon australis Small but, there is no mention of a square stem. The Obedient Plant, Physostegia virginiana has similar flowers, but the arrangement is all wrong. However, the Obedient Plant does have a square stem. One of these days the answer will present itself. That's another bit of fun I have with journaling. Japanese Honeysuckle is blooming as is Coral (wooodbine), Lonicera sempervirens. 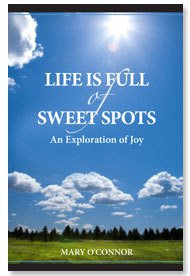 I've a sample in the refrigerator waiting for me to complete the journal page I started. Also on that page will be clipping from the flowering Sparkleberry, Vaccinium arboreum. I found both when walking on a trail along side the Okatie River. The leaf, just before the Coral Honeysuckle's flowers, is amazing. How does nature come up with these designs? The last two weeks I've enjoyed breezes filled with the scent of Tulip Tree flowers, Liriodendon tulipifera. And, yesterday I noticed the Sweet Bay, Magnolia virginica, is starting to bloom. So, basically, I need to clone myself, as working for a living is really putting a dent in my journaling time :) Oh, did I mention the field of Sourgrass (wild sorrel), Rumex hastatulus with the back drop of flowering dogwoods? That photograph may have to be used to create a painting. I looked it up and you have hit the mark!